Elizabeth's offers a variety of men's jewelry in both sterling silver and gold. If what you are considering isn't in stock, nearly any style of men's jewelry can be special ordered. Money clips, pocket knives, watches, sun glasses and golf tools round out the men's gift offerings at Elizabeth's. 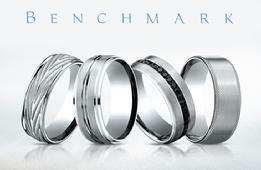 The wedding specialists, Benchmark provides the highest quality rings, engineered for comfort. The Benchmark brand, with its curved inside, was the original "comfort fit" design in the United States. Their precision-setting technology allows as much as is possible of the diamond's surface to be displayed while also providing superior stone security. 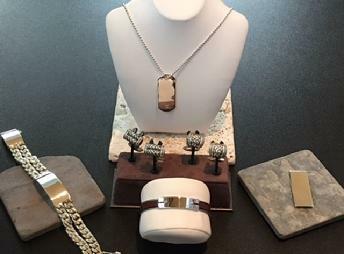 Among our men's jewelry selection is the Benchmark FORGE line featuring an assortment of alternative metals such as Tungsten, Titanium, and the newest metal, Cobaltchrome. Cobaltchrome is a new generation of contemporary metal that offers extraordinary characteristics. Incredibly hard, Cobaltchrome provides strength, resiliency, is shatterproof and scratch-resistant. Though four times stronger than platinum, Cobaltchrome is sizable, and comes with the Benchmark Lifetime Guarantee.